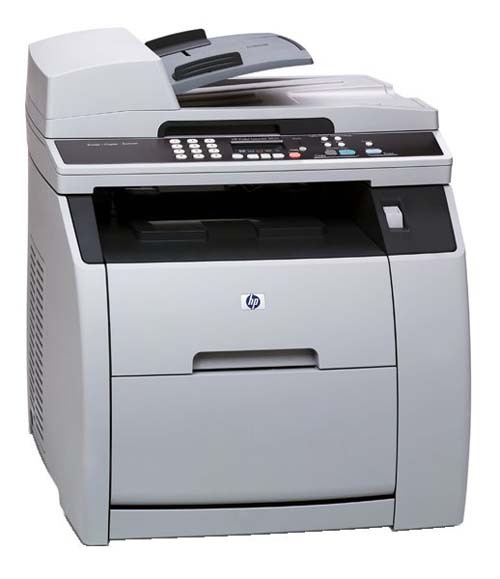 The HP Color LaserJet 2820 gives you color copying, network printing, scanning. A great way for a home small office to consolidate several machines to save space. The 70 pound unit takes up a 20” x 21” space on a sturdy desk. Its 21-inch height brings the multi-function at a comfortable standing height when using the scanner or copier functions. Although a USB or Ethernet network connection is required to run the printer, the control panel allows for the LaserJet 2820 to also function as a walk-up standalone machine for the other features. Scanning, faxing and copying controls can be performed without the need for a computer interface. The LaserJet 2820 does not come with the 250-sheet cassette tray that’s found on the LaserJet 2040. Instead, the flip-door opens to a 125-sheet multi-purpose tray that can handle paper, labels, post cards, envelopes, 4” x 6” cardstock up to 8.5” x 14” legal paper of various bond weights. A 50-sheet Automatic Document Feeder allows for quick single-sided scanning, faxing, and copying of multiple pages up to 8.5” x 14”.. The ADF lifts to use the glass platen for scanning and copying books or single sheets. As a printer, the 2820 can connects to your Mac or PC through USB 2.0, or via its built-in Ethernet. To achieve the 2400 x 2400 color resolution, HP utilizes a technique where each dot in the native 600 x 600 dpi contains 4 colors. Think of it like having a whole pie then cutting it up into 4 smaller pieces. At the maximum print resolution text is reasonably sharp, and photographs are very detailed with smooth color transitions. Using a instant fuser technology, the LaserJet can go from sleep to print in 18 seconds. 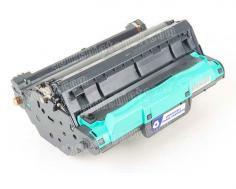 The 2820 uses multi-pass printing technology so B & W prints are 20 ppm, and color prints take 4 pages per minute. Understanding the printing needs of today’s businesses and the software applications and suites they often use, HP has installed the popular PCL 6 and PostScript 3 emulators. As a copier, this multi-function can zoom from 25% up to 400%, and make up to 99 copies in color or B&W. Copy quality can be set either manually or automatic for contrast, text or photo modes. The color scanner portion of the LaserJet 2820 is compatible with TWAIN & and XP/Vista/Win7 WIA standards. The 1,200 x 1,200 dpi resolution can be enhanced to 19,200 dpi. Having built-in Ethernet network support and a hi-speed USB, this multifunction is right at home either in the middle of an office floor or connected to a secretary’s computer. HP also equipped the 2820 with a surprising 96MB of memory. Memory can be expanded up to 224MB, enabling the LaserJet to easily handle workloads as a high-volume network office printer. 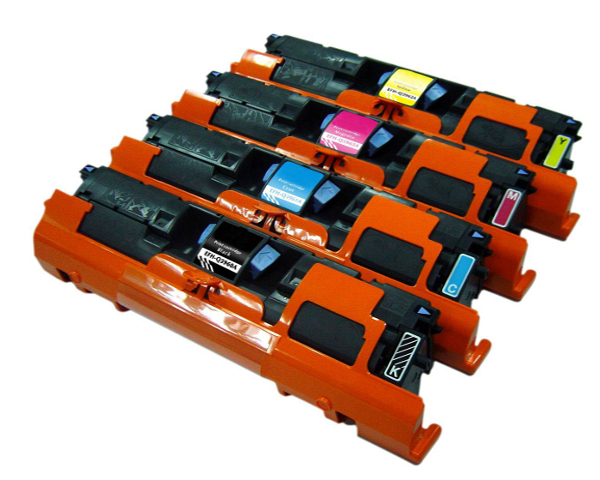 One of the things you need to consider when you decide to get a color laser printer is if you want a “multi-pass” color printing or “single-pass” printing. The LaserJet 2820 is a color multi-pass printer: color printing is 4 times slower printing because the paper has to pass through each of the 4 toners. It’s similar to the way t-shirts and posters are manually silk-screened. If you plan on a lot of color printing, you might want to opt for a single-pass printer instead. HP slyly chose to list the noise level of the printer in “Bels”, not the typical decibels. Saying the LaserJet is only 6.6 Bels makes it sound (no pun intended) less noisy than saying it’s makes 66 decibels when printing. Whether it’s Bels or decibels, this is a noisy printer that you don’t want sitting next to you. Review it: "HP Color LaserJet 2820 "
Out of the box, HP includes a full standard 5,000 page black toner. Unfortunately, the three color toners provided are only 50% full, providing only 2,000-pages. It may be a good ideal to order the standard 4,000-page yield color cartridges. While 2,000 seems like a lot of printing, remember that those print numbers are based on the always asterisked “5% ink coverage per page”. To give you an idea of what that mean’s: a standard business letter uses 5% ink coverage; a newsletter 30%, and a print with graphics, text, and photos can exceed 60%.